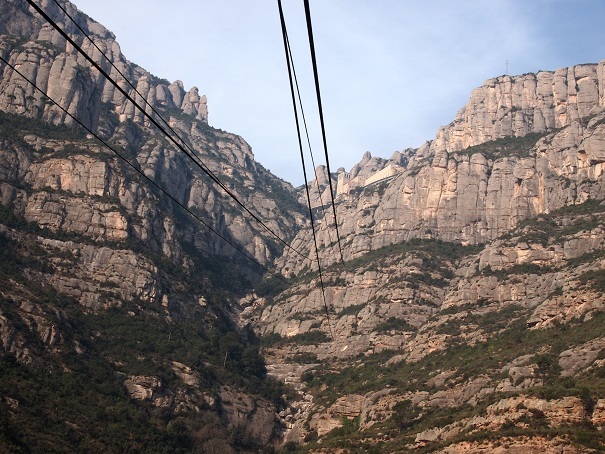 March 11, 2012 — The path to spiritual enlightenment in Spain is apparently up an extremely thin set of cables to the top of a very tall mountain. Of course, that’s not what I was searching for. I just wanted a couple of photo ops with a 1,000-year-old religious icon and maybe a swing through its gift shop. 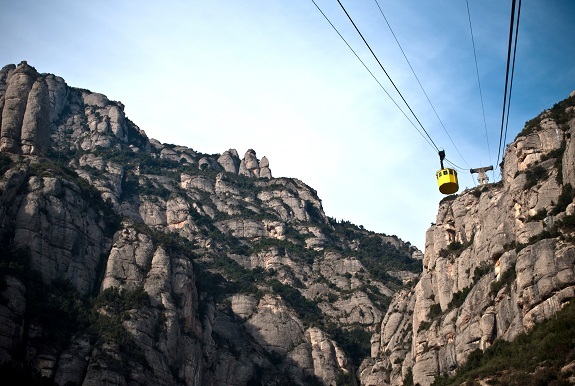 Montserrat is a wide, ragged range of peaks in Catalonia, just outside the city of Barcelona. Its highest point is only 4,000 feet above sea level, a height that won’t win it any NBA contracts, but does make it the highest point in the region and a unique mountain for various reasons of location and geology. 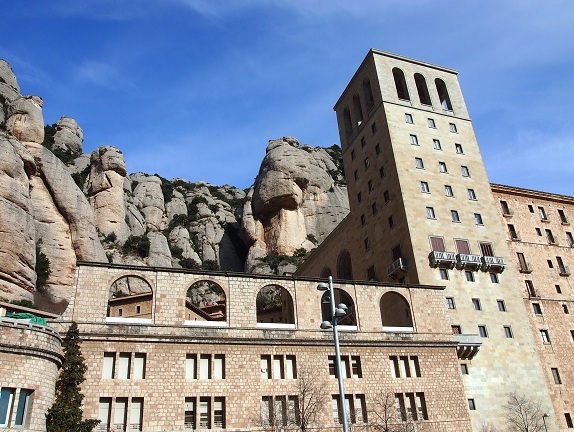 Even better, perched atop one of those crags is Santa Maria de Montserrat, a millennia-old Benedictine monastery that is the keeper of one Europe’s fabled Black Madonnas. There are various ways to ascend the mountain. You can drive or take a bus tour up terrifyingly winding roads. You can hike it if you’ve got a vendetta against your legs and lungs. You can take the funicular, an uphill train that hits ascending inclines worse than what astronauts put up with on launch pads. Or you can opt for the cable car, which is what we did, both because it’s the quickest way up and because it sounded like too cliché a manner to die for the Grim Reaper to stoop to for us. At the base of the mountain, the cables seemed impossibly thin and disappeared into the distance above us. The small yellow cable car had a maximum standing occupancy of 35, and judging by the shoulder compression of the riders, I think we met it. The mountain was a craggy monstrosity at the top of which you could just barely make out the perfectly cornered parallelograms that denoted man-made structures. And a few creaky, swaying, rock-scraping moments later, we were at the monastery. 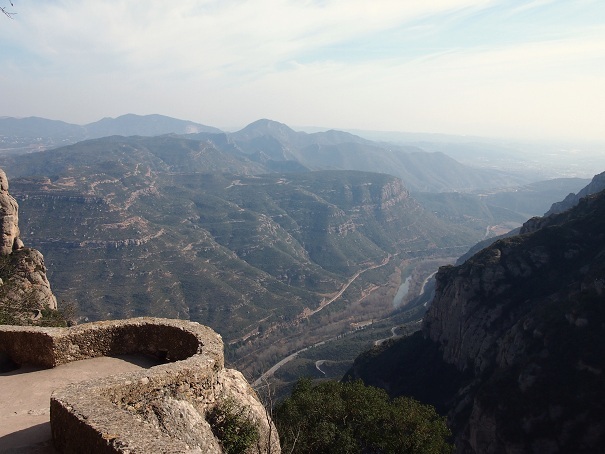 At the top, the view was heady and seemed to encompass almost all of Catalonia. The whole thing was further dramatically heightened by the mountain’s strangely shaped crags of rock, which framed the scene and stretched off into the distance on all sides of us. It was obvious that we were not “on” the mountain, but on just a small part of it. 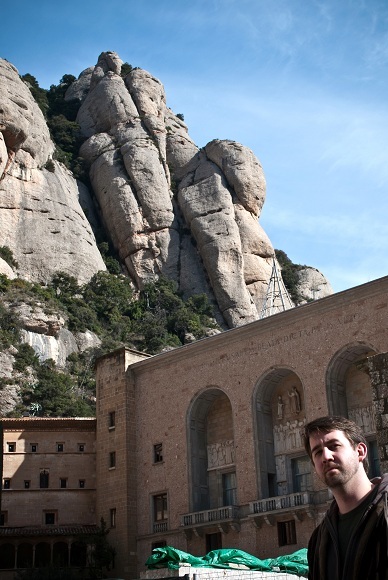 The cable car dropped us off right at the monastery complex, which is plain, blocky, and rock-colored. Much of it is rather new, as well, despite the age of the overall site. The monastery has endured much in its thousand years, including a couple of trashings by Napoleon, a Spanish civil war, and various attacks by nature. God is no respecter of monasteries. Somehow, both the large gift shop and cafeteria survived, though. 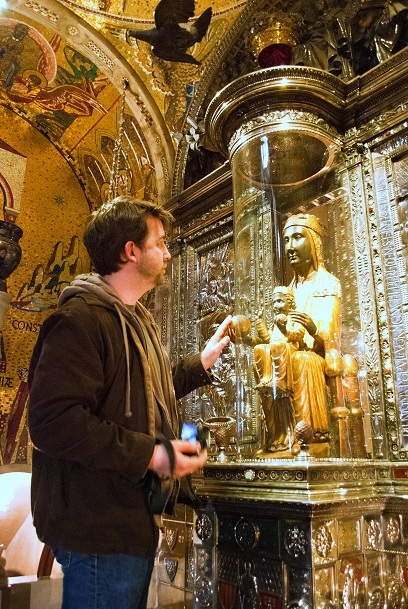 But if you’re not looking for an Iberian ham sandwich or a replica Black Madonna statuette, the basilica is where all the cool stuff is, where the 80 or so monks that live on Montserrat are quartered, where the worshipping takes place, where all the religious art is, and where the Black Madonna holds court. The basilica doesn’t stand out from the other buildings, really. 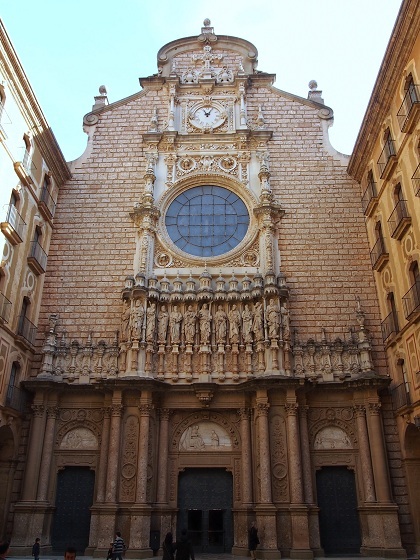 You enter through one of the blocky facades into a courtyard, at the end of which is the entrance to the basilica itself. As far as Catholic churches go, it’s a relatively humble exterior, although as far as Protestant churches go, it’s relatively opulent with its statues of Christ and the disciples. Inside, it’s like many basilicas, with amazing artwork and murals, elegant carvings and statues, arching ceilings and glowing stained glass windows, all created by masters both known and unknown. At the front of the church, high above the dais like some trapped angel fruitlessly banging its wings against the ceiling, was the Black Madonna statue. Known as the Virgin of Montserrat or, in the native tongue, la Moreneta (“little dark one”), its story goes that sometime in the ninth century, shepherds on the mountain followed strange music and lights to a cave, where they discovered this three-foot-tall wooden statue of an enthroned, dark-skinned Mary and the infant Jesus. The monastery was then built on the site as a result. 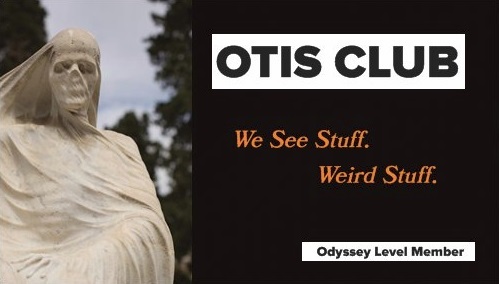 The real back-story of the statue is unknown. Some try to trace it back to Jerusalem circa apostolic times and others say it’s local and “only” goes back to the thirteen century. Whatever the source, it’s assumed to involve a knife, paint, and a hunk of wood. As to the skin color of Mary and Jesus, there is a tradition of Black Madonnas throughout Europe, dating back to medieval times. For most of these statues and artworks, including Montserrat’s, the black hue is often attributed to discoloration from years of candle soot. However, these days, as part of her upkeep, the monks at Montserrat go ahead and Rolling Stones her skin. Most fun, you can actually get up close to the Madonna and touch it. To do so, you enter through a side door of the basilica, which takes you through various chapels that parallel and give a view of the main auditorium. Depending on when you go, the lines can be pretty long. On a Saturday afternoon in late February, it took us about 40 minutes to get to her. But there is a lot of artwork to marvel at on the way. There’s also an offshoot stairs along the way down to a small chapel-like crypt where some of the abbots are buried. Finally, at the end, we ascended a staircase to a small alcove that overlooks the church. It only fit two or three people at a time. 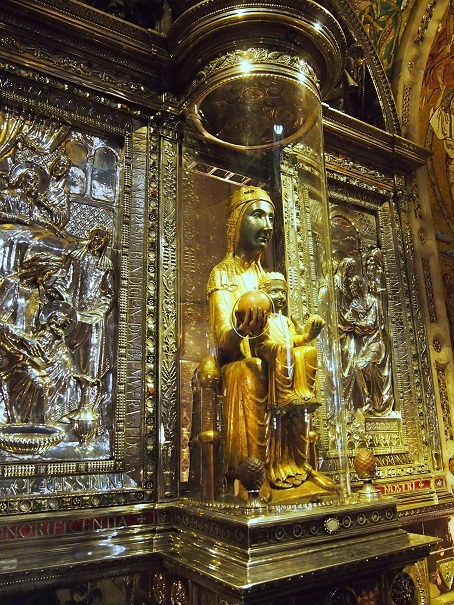 The Black Madonna is encased in glass there except for a croquet-ball-sized sphere in her hand which protrudes from the glass, allowing visitors to touch it to receive a blessing. We used ours for the return cable car trip. Unfortunately, one thing we didn’t have time to do while we were there was to take any of the myriad walking trails that wend through the mountain. From the monastery you can look into the distance to see cliffs populated by more awesome people than ourselves who had done just that. In fact, the Madonna’s supposed cave itself, Santa Cova, is accessible by one of these walking paths, only about half an hour’s walk down a gentle slope that turns into an exhausting ascent on the return trip. In the end, I don’t foresee myself ever being a spiritually enlightened man. Introspection, patience, and self-denial are hard. But I can cross “visit a mountain-top monastery” off my list. Me and Leonard Cohen now have that much in common.